Dining Room Rugs – When starting a home decor project, a good place to begin is the dining room and finding the perfect dinging room rug. You want a piece that will tie the entire dining room together. 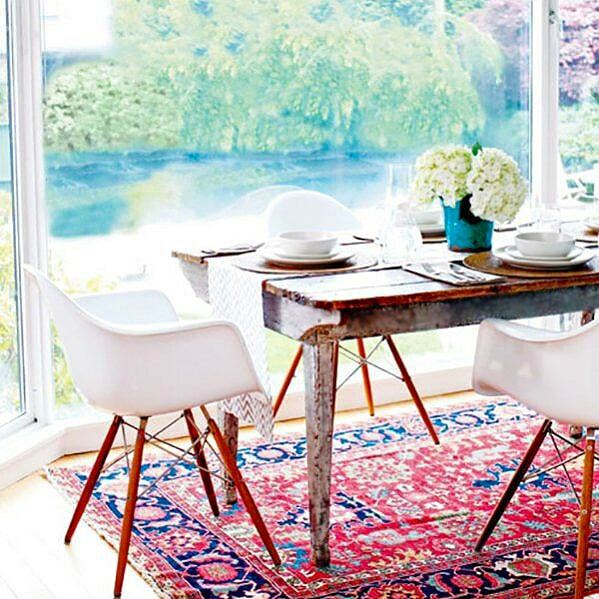 A rug that will act as a spring board to design the rest of the dining room around. Regardless of the room, or starting point, finding the right rug will set the tone for the room and will help you choose the rest of the furnishing and decorations. 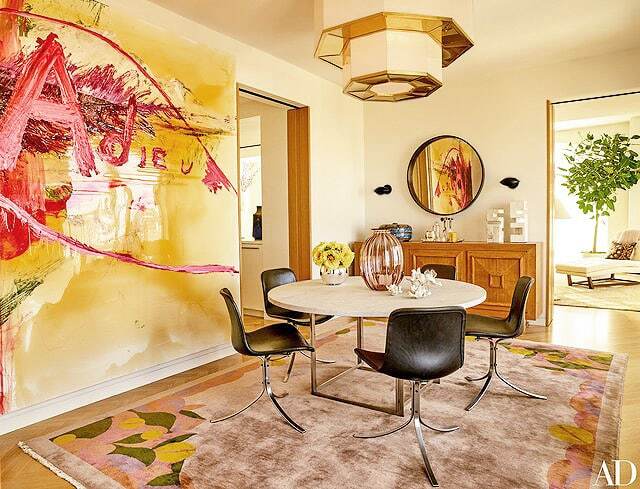 Dining room rugs aren’t just functional – they can be stylish, too. Search for a rug that’s large enough for the space and that will help balance the decor of the room (while protecting the floor and withstanding foot traffic, chairs sliding and food / drink spills). No matter how much you love a specific area rug, it won’t work well in your home’s dining room if it’s not the right rug size. 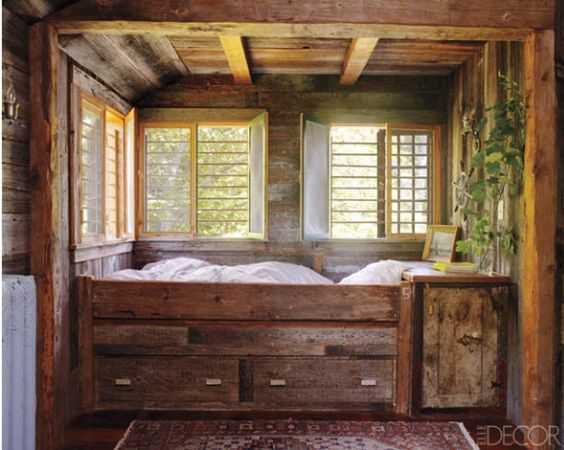 You shouldn’t even think about things like colors, patterns and pile until you know the exact size range you can use. If you get a dining room rug that’s too big, it can overwhelm the space and look more like full wall to wall carpeting than a fashionable focal point. Smaller rugs, on the other hand, might not be big enough to cover the area underneath the dining room table. So with that in mind, you need to measure the size of the table you want in the dining room. Once you have the table size, you need to think one how you want to position the rug and furniture. Things like the dining room chair legs being on or off the rug is a totally personal preference so don’t try to limit your self too much. If you like, you can place all the dining room furniture in the room that you plan to have in there. This includes both large and small pieces, from the chairs and table to floor lamps and side bars and so forth. Pull the chairs away from the dining tables in the room so you can either look for a rug that’s large enough to fit the chairs or that’s small enough to not get in the way of them. Then, take a piece of painter’s tape and mark the outline of the furniture. You’ll then need to measure this area to determine the rug size your dining room needs or can take. The reason for doing this is so you can measure the entire space that you want the dining room rug to cover. In order to create symmetry in the dining room, look for a rug that’s similar to the shape and proportions of the room itself. For example, if the dining room is rectangular, you’ll want a rectangular rug; if it’s square, you’ll want a square rug and if its a round room you probably will want a round rug shape. It’s also a good idea to have your dining room rug be a similar shape to the main dining table that is in the room. If you already have a dining table, look for a rug that mirrors its shape; if you don’t have a table yet, wait until you pick out the perfect rug for your room then get a dining table that works with the size and shape of the rug you selected. 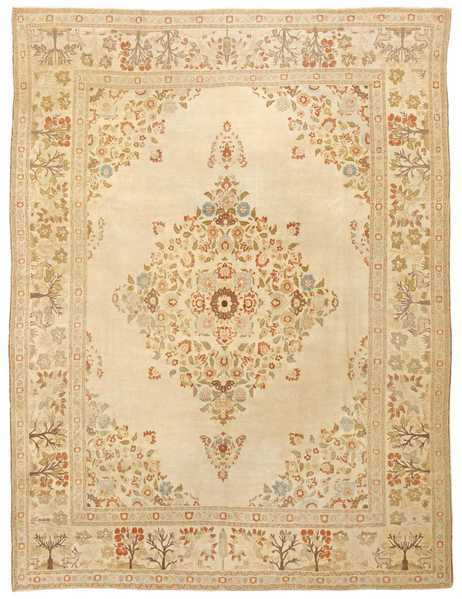 The rug is going to be the focal point of the dining room, which is why its colors and patterns are so important. If the rug is under a dining room table where you eat most of your meals, the color or pattern should be able to stand up to spills. For example, you don’t necessarily want a white rug in an area where there’s going to be a lot of food and potential spills. 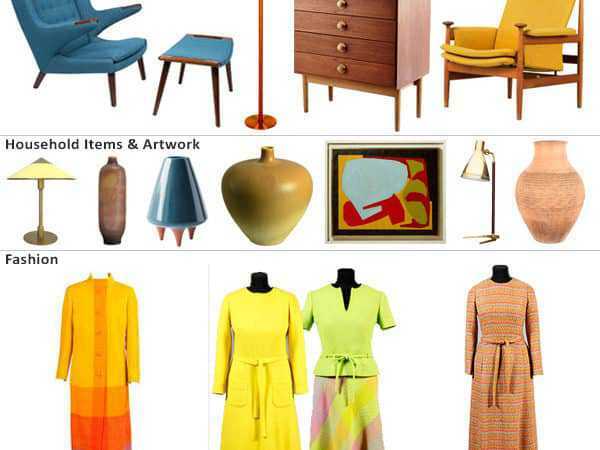 The best option is to go for a color or pattern that will work with the other furniture and interior decor items in the dining room but that’s deep enough to camouflage any accidents. If the rest of the room isn’t too busy, you can get away with a bold pattern, and the more complex the pattern is, the better it’ll be at hiding signs of wear and spills. If your dining room floor isn’t in great condition, getting a bright color or a bold pattern is a good idea is since the rug will draw the eye to it and away from the rest of the floor. 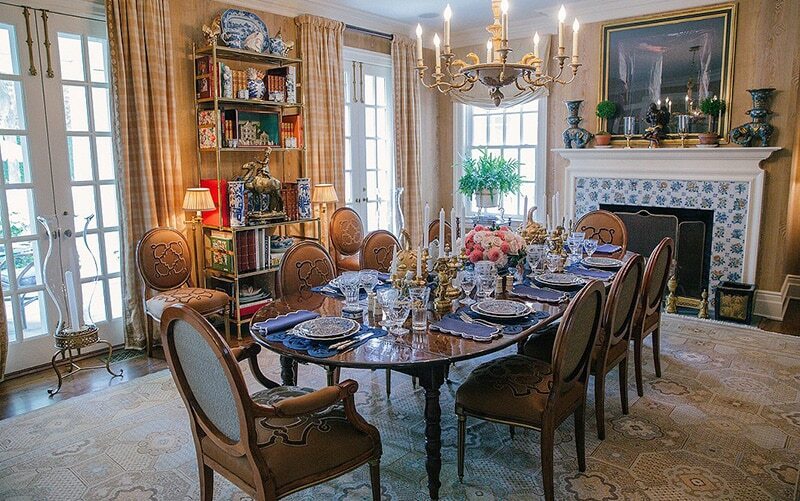 What Materials Are Best For Dining Room Rugs? The material used to weave the rug isn’t going to be nearly as important as characteristics like size and color. That said, it is still something to consider, especially if you spend a lot of your time barefoot. Do you want a cozy, plush shag rug? 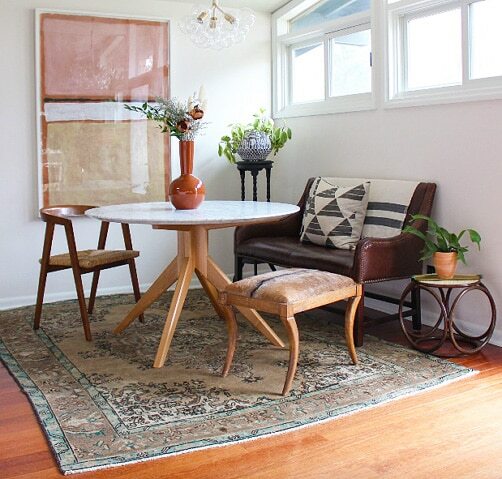 Go for Moroccan rugs style or even a vintage mid century rug that has plush soft pile. But keep in mind that in the dining room you will have chairs sliding on the rug so you want it to be easy. In rooms with chairs that are going to be moved in and out, you may want to opt for a lower pile rug but probably not a flat weave rug or kilim as those may not be as durable as you need them to be. When it comes to buying rugs for your dining room (or any home decor item or piece of furniture, for that matter), go with your gut and your heart. You may end up breaking a design guideline or two, but you could end up finding that perfect piece that truly works for your home and exemplifies your personal style. 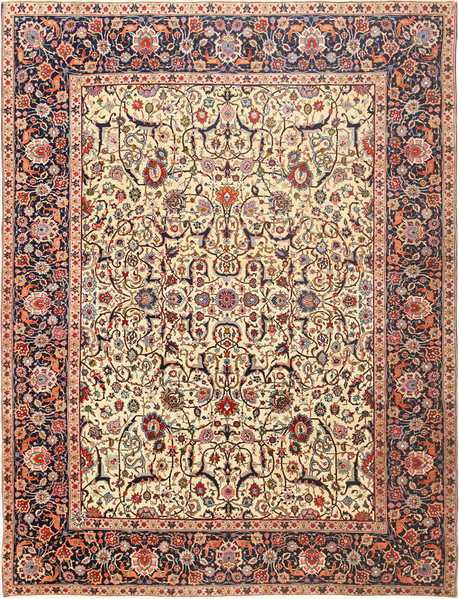 Keep in mind that by investing in an Antique Persian, your dining room rug becomes one of a kind. From shearing sheep, to the passionate process of weaving the rug, each and every Antique Persian rug is made entirely by hand. Therefor, no two antique Persian rugs are exactly the same. This is what makes them such a wonderful investment for your home. 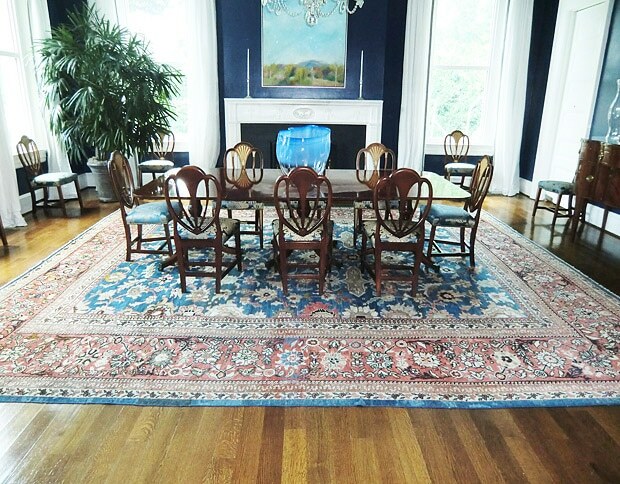 Interior decorator, Jaclyn Joslin, says splurging on an Antique Persian for your dining room rug is totally worth it. She did, and loves how it looks. 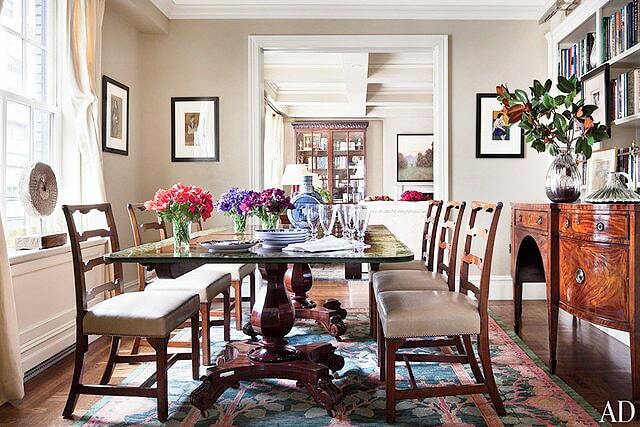 See how she incorporated her dining room rug below to create a neutral, calm look, embodying casual elegance. Photo courtesy of the designer herself. When shopping for dining room rugs, it is important to think about the rug as a frame of sorts. 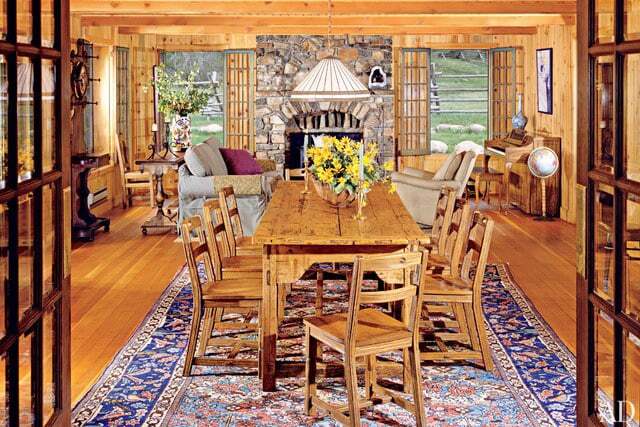 In most cases, once one places a dinning room table over the rug, it will cover the majority of the field design. So when you are picking your new or antique carpet, make sure to pay close attention to the rug’s border. The border will end up being the most prominent and visible part of the rug. So make sure to pick a dining room rug that has a beautiful border that will showcase and enhance your dining room’s decor and style. 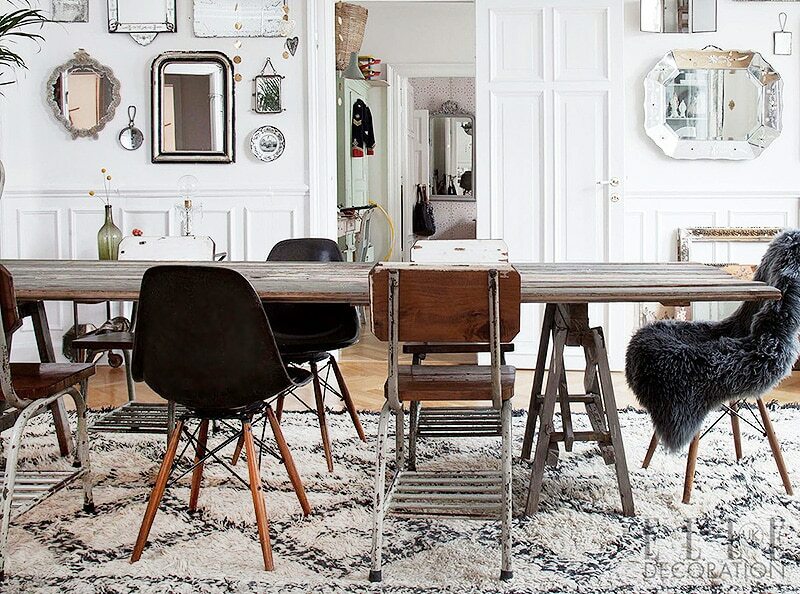 Are you feeling inspired by our dining room rugs and ready recreate the look? 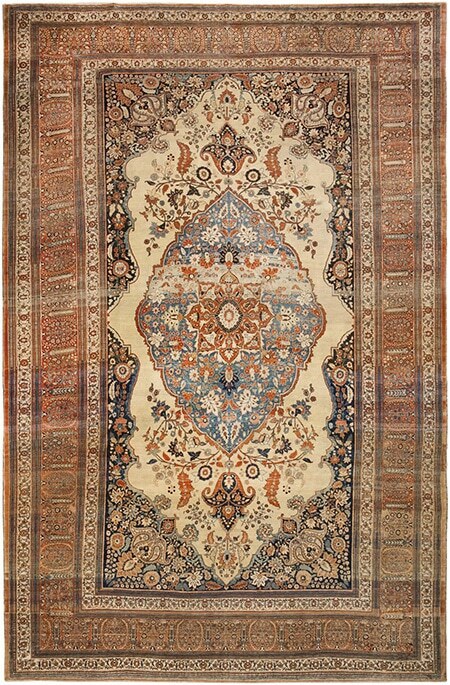 If you’re looking for dining room rug, antique Persian rugs are surly worth a look. They can work perfectly with nearly any decor theme, and the unique style will make your dining room stand out. 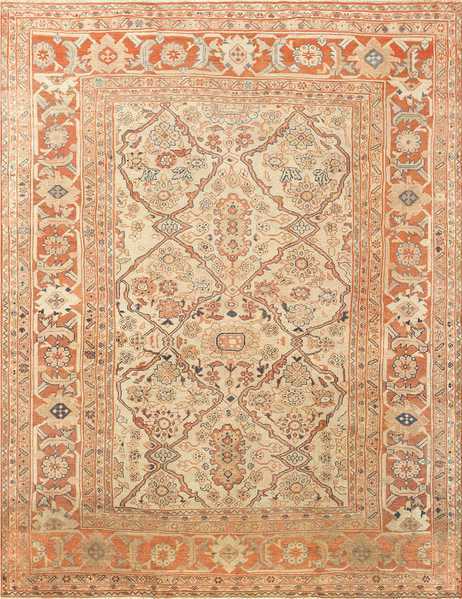 This antique Persian Tabriz rug’s color scheme is made up primarily of earthy browns and rust-colors. 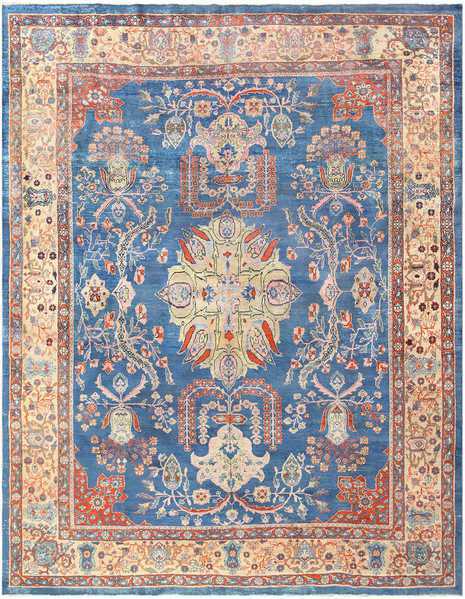 These colors, lends it an ancient and classic look while the center of the design draws the eye with light blues, reds and oranges. 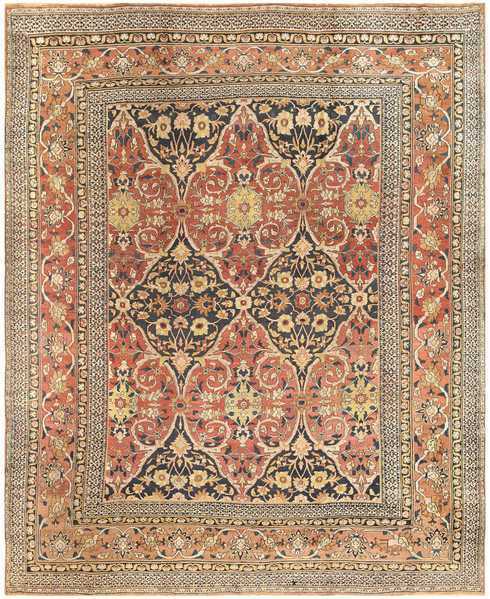 Because of its coloring and elegant border design, this rug pairs well with dining room tables made of darker wood such as mahogany. 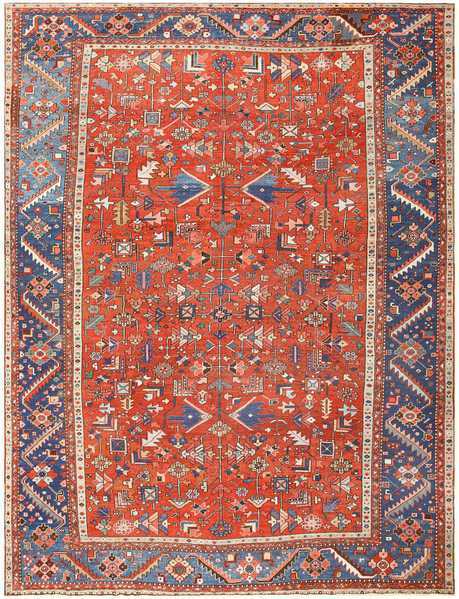 The Persian Heriz Serapi rug features vibrant colors, primarily bright rusty reds and blues, while the center is cluttered with a myriad of tribal and geometric design shapes. Compared to many other Persian rugs in the collection, the Heriz Serapi rug is better-suited for a more casual style dining room. This inviting rug could fit just as perfectly in a dining room of a relaxed city loft as it would in a rustic old converted country barn. This Persian Tabriz rug is simple and elegant. It is light colored throughout save for rust and blue flowers. The central field features carefully arranged leaves and flowers while the border contains depictions of deer and trees. The woodland theme of this rug makes it perfect to match with a carved wooden dining table, and can also be wonderful if your dining room overlooks woodlands in your backyard. There is no doubt that the border of this magnificent carpet will frame an elegant dining room table in the most perfect and complimentary way. 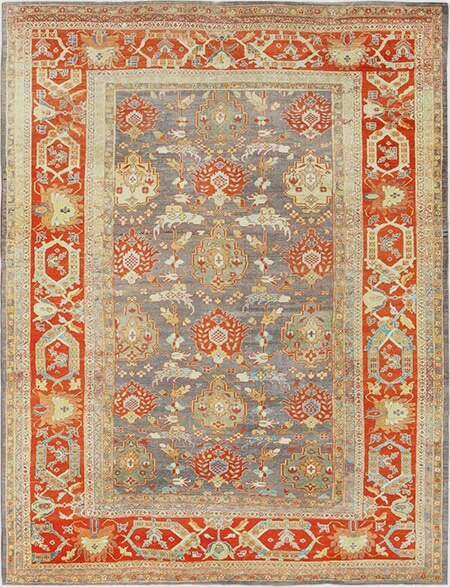 This gray Persian Sultanabad rug is grandiose in design, with vibrant reds dominating the border’s color scheme. Therefore, this carpet is best used for larger, elegant dining rooms, surrounded by beautiful antiques and orientalist painting. 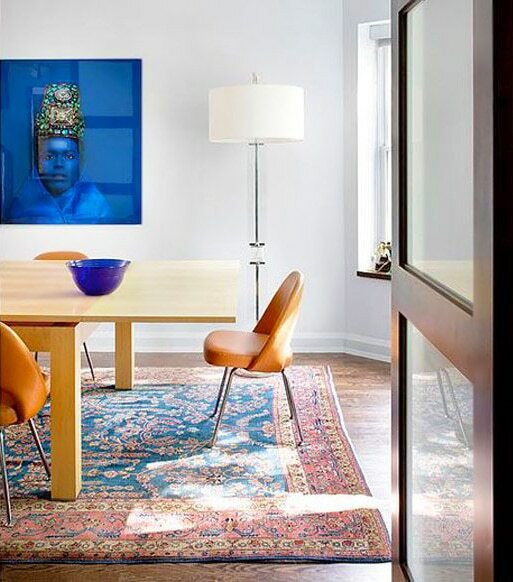 If you want your dining room to be bright and welcoming but in no way stuffy or uptight, this rug is a great option for the sophisticated rug buyer. 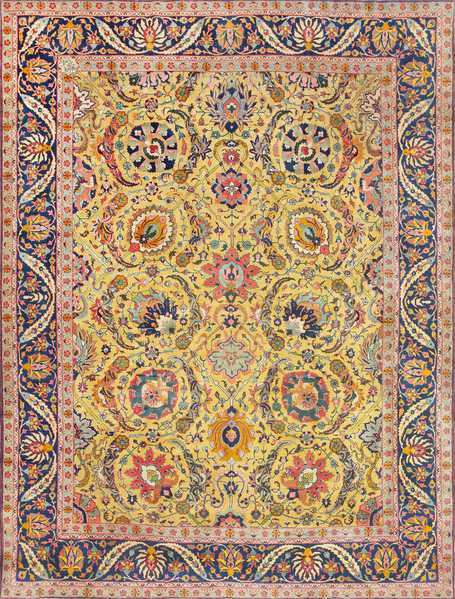 Thanks to the incredibly intricate design, this Tabriz rug is hypnotizing to look at . The center of the rug features colorful floral shapes interwoven with black spindly lines like the branches of trees. While the border is similar in design, it features a darker blue background which instantly creates a beautiful juxtaposition. It is well-suited to grandiose dining rooms with large wooden tables or chandeliers, and it also makes for an interesting conversation piece. The layout of this Persian Bakshaish rug is uniform and orderly, with the same shapes repeated throughout. 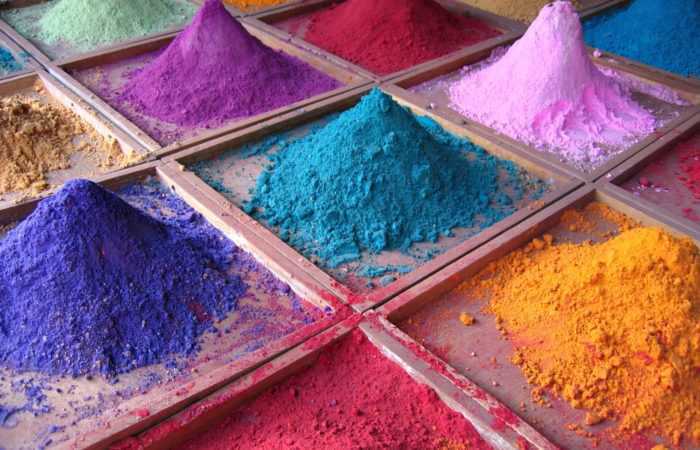 The color scheme is primarily rusty reds, camels, ivory and blue. A few of the shapes also feature touches of a lovely shade of salmon. The simple geometric tribal and colorful design motifs makes it a great choice for a room that incorporates beautiful mid century modern and / or antique dining rooms. Tan and rusty orange tones dominate this Persian rug which makes it evocative of bright desert sands. The center has a tan background that features crooked primitive line patterns which encircle floral shapes. If your dining room has tan and earthy colors, you can easily use this antique rug to create a magnificent warm and inviting room. This Persian Tabriz rug has a happy eye catching yellow background in the center. This rare yellow colored field is overlaid with patterns featuring a wide array of colors from rust to blues to pinks. Because the vibrant yet not overpowering shades draw the eye, this rug is a great choice if you want it to be the centerpiece of the dining room, or if you’re trying to create a bright and colorful atmosphere. This antique Persian Khorassan rug is dominated by soft cranberry reds and tans, with navy blue repeated medallions. Its size combined with is artistic border pattern and coloration, make it perfect for an elegant dining room where you can enjoy quiet family dinners. 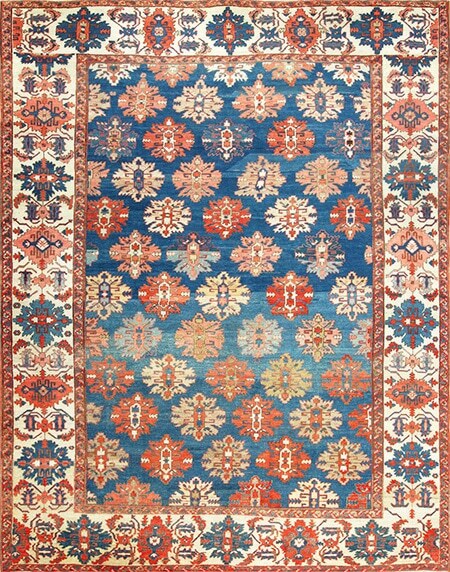 This Persian Sultanabad rug is dominated by a field of light electric blues. This magnificent field color is framed perfectly by the lighter colored border. 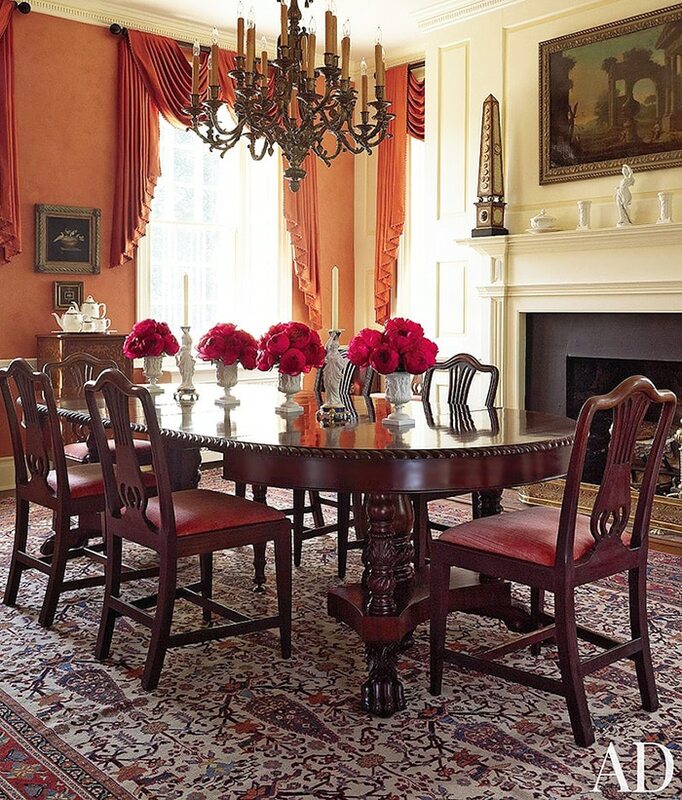 Grand designs and bright colors give this rug a luxurious regal feel, making it better suited for elegant dining rooms. This interior design blog , about choosing the perfect dining room rugs, was published by Nazmiyal Antique Rugs which is located in New York City.